Clayoquot Wilderness Resort is simply magnificent. I had an extraordinary time there a few weeks ago, and it is really hard to explain how wonderful the resort, its owners and crew truly are. Clayoquot Sound is located on the Western edge of Vancouver Island and is an UNESCO Biosphere Reserve. It is located by a temperate rainforest home to wild salmon, rare species and giant cedar trees more than 1,000 years old. 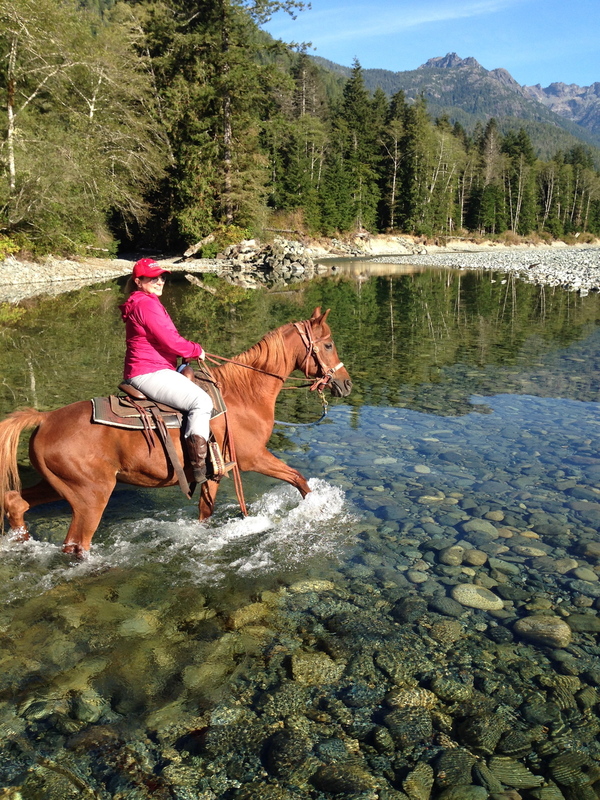 Clayoquot Wilderness Resort is an eco-safari adventure, however, I think it appeals to all age groups. Adults will marvel at the great variety of activities and adventures. Children will also have an absolute blast with the range of experiences suitable for them, such as archery, paintball, zip lines, horseback riding, boat rides, mountain biking, fishing, kayaking...the list goes on and on. Older guests will thoroughly enjoy the beauty and peacefulness of the location. While this resort is considered glamping (glamorous camping), you are living in pure luxury. Most tents have an ensuite bath. The bed is ridiculously comfortable. The furnishings are beautiful antiques. There is turn down service each evening where your tent is filled with candles. The only way a guest flying from the US into Vancouver can reach the resort is by seaplane. Vancouver International Airport actually has its own seaplane terminal. The flight over Vancouver Island is absolutely breathtaking. It is mountainous with pools of water everywhere. All nine passengers on my flight were guests of the resort. When we landed, we were greeted by the owners, John and Adele Caton, and many of their wonderful crew members. It was a bit like Fantasy Island, cowboy style. After a 5 minute wagon ride to camp, we were greeted with cocktails at the clubhouse. The clubhouse is where people gather at the beginning and end of each day to talk about their amazing activities often while sitting in front of a huge fireplace. The clubhouse is also where the meals are prepared by Chef Ryan Orr. The food was absolutely spectacular. Each meal was better than the last. Tereza Roux is a terrific and engaging sommelier. Her passion for wine is evident, and I am now a huge fan of wines from the Pacific Northwest! The resort has only 20 tents, so you get to know the other guests quite well. Yes, I said tents. Large tents are tucked into the woods on the edge of a river with a network of boardwalks. You enter your tent with a zipper, like a regular tent, but nothing else is regular about the tent. 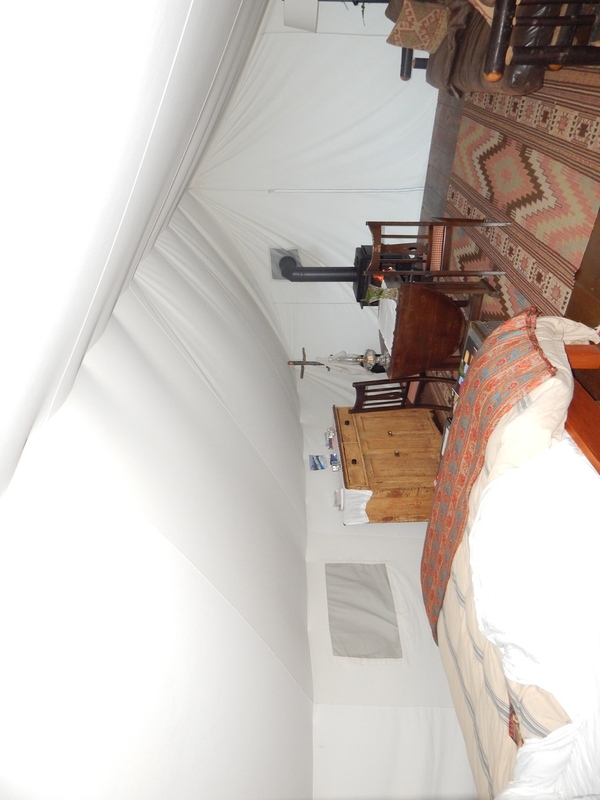 It has an ensuite bath, four poster bed, beautiful antique furniture and gas stove. I couldn’t have been more comfortable in a nice hotel room. The only discerning part about staying in the tent was the horn kept on my nightstand to alert the crew and dogs if a bear decided to join me! Each evening, the guests decide what activities to do the next day. My absolute favorite activity was riding a zodiac through Clayoquot Sound to visit with black bears, bald eagles, orcas, sea lions, harbor seals and sea otters. It was breathtakingly beautiful. In the afternoon, we landed on Flores Island and hiked through ancient old growth Sitka forests, with the largest trees I have ever seen, and pristine beaches with bear and wolf prints everywhere. It was gorgeous. The trail we hiked has existed for thousands of years, originally used by the Ahousant people. Check it out at http://www.wildsidetrail.com/Home.html. When we returned to the resort, each guest chose what activity to do the next day, then enjoyed another amazing dinner created by the Chef and his team. There is also a spa onsite...in a tent, of course. In fact, after a long morning trail ride to a deserted gold mine, I enjoyed one of the best massages followed by a delightful glass of wine, an amazing dinner prepared by the Chef and his team, followed by another delightful glass of wine suggested by Tereza while sitting outside in front of the glowing fireplace. In May and September, the resort is filled with couples and older guests. In July and August, the resort is perfect for high energy families. Guests arrive from all parts of the World. Clayoquot Wilderness Resort should be on everyone’s bucket list. I cannot find the words to adequately describe how much fun is experienced by all its guests, young and old. Similarly, my pictures do not do it justice. I have posted them here, just to give a sense of why Clayoquot Wilderness Resort is so special. LUXURY HOTELS OPENING JUST IN TIME FOR SPRING!